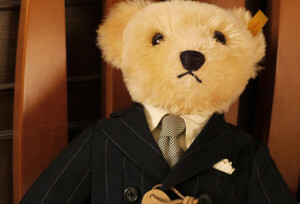 Prime Minister John Key is facing questions this morning over the appointment of his childhood friend and two foot stuffed teddy bear Teddums to the directorship of the Government Communication Security Bureau, New Zealand’s state intelligence agency. Teddums, who has served as the director of the GCSB for more than a year, was appointed in 2011 as the result of a hiring process undertaken by the State Services Commission. But Labour is alleging that the process was tainted by the Prime Minister, who they say put pressure on the commission to hire Teddums above other candidates. In Parliament last week, Key asserted that he had no involvement in the hiring process, and that he knew Teddums “only vaguely.” But since then it has come to light that Key had a much closer relationship with the stuffed teddy bear, who reportedly grew up with Key in his family home in Christchurch. Key has also admitted that he phoned Teddums in 2011 to encourage him to apply for the directorship of the GCSB. State Services Commissioner Iain Rennie said yesterday that he was “surprised” to learn that Key had phoned Teddums, in large part because he was unaware that the GCSB director could use a phone. But he also said that he felt the whole situation had been “overblown” and assured media that his commission had handled the process appropriately. Grant Robertson acknowledged that Teddums was fully qualified for the directorship, but noted that there were many other qualified candidates – such as a tiny microphone and a lobster named Gary – who were not even given an interview. Sources close to the Labour Party are reporting this morning that they have good reason to believe the relationship between the Prime Minister and his teddy bear was much closer than is currently thought, and insinuated that there may even be evidence to suggest that John Key and Teddums once slept together.